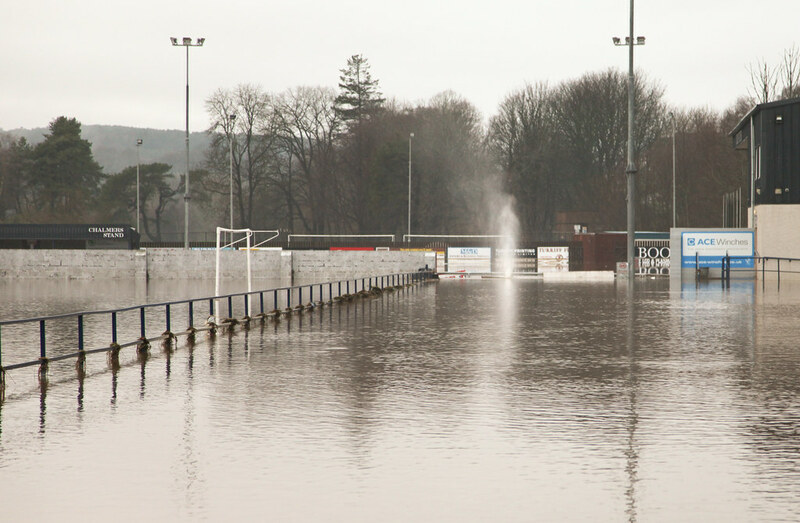 There has been significant flooding around the sports pitches and Turriff United’s ground overnight. The rising flood water knocked over the wall and gates at the end of the car park and behind the dugouts during the night. This morning Turriff United pitch was under about two feet of water. The collapsing wall damaged the gas meter for the ground and there is currently what is classed as a medium pressure gas leak. Members of the public were being kept away from the area, and there was a strong smell of gas around Castle St and the Auld Kirk. The gas leak had been stopped by 11am this morning. Now it is a case of waiting for the flood water to recede so club officials can see what damage has been caused to the buildings and pitch. It goes without saying that everyone connected with Turriff United is devastated at the scenes from the Haughs this morning. Pictures posted on social media this morning brought a tear to my eye as they clearly show the level of destruction at a ground we are all so immensely proud of. The thoughts of Turriff United at this time are also with the people throughout the North East of Scotland and beyond, who are suffering far worse than we are, in their own homes. Hopefully we have seen the worst of the weather now and the clean-up can begin in earnest. Gairn also confirmed that Saturdays match against Buckie Thistle has been postponed.